When I first attended the macrobiotic center near my home in Milan a few years ago I had already been on a journey to a healthier whole food lifestyle for many years, but I had some extra work to do, which is why I decided to attend the introductory cooking class and seminars offered by the center. I learned a ton of new things about the food and body connection and new cooking techniques but much of the information shared and most of the ingredients used were familiar to me. However, I met many people there who were like fish out of water, most of whom had never eaten brown rice, had never even heard of quinoa or soba noodles, much less miso soup, tempeh or umeboshi. The macrobiotic experience not only solidified my plant based whole food approach, it also drove me to starting this blog and embarking on a two year adventure to become a Registered Holistic Nutritionist so that I can help others on their own personal journeys to a healthier lifestyle. While my plant based whole food journey has been years in the making, for many others it’s just beginning and that can be very daunting. Thankfully, in this day and age, there are a ton of resources from books to blogs to help people get there. 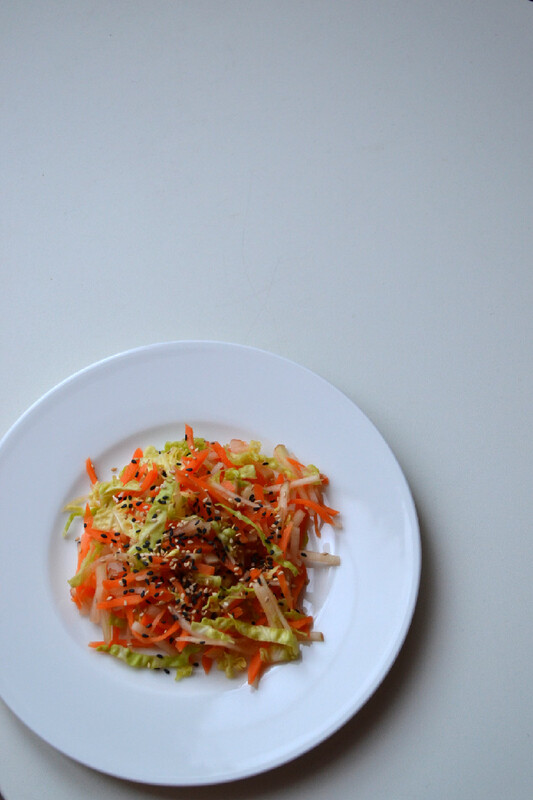 Today, I’m sharing a recipe for a simple pressed salad. 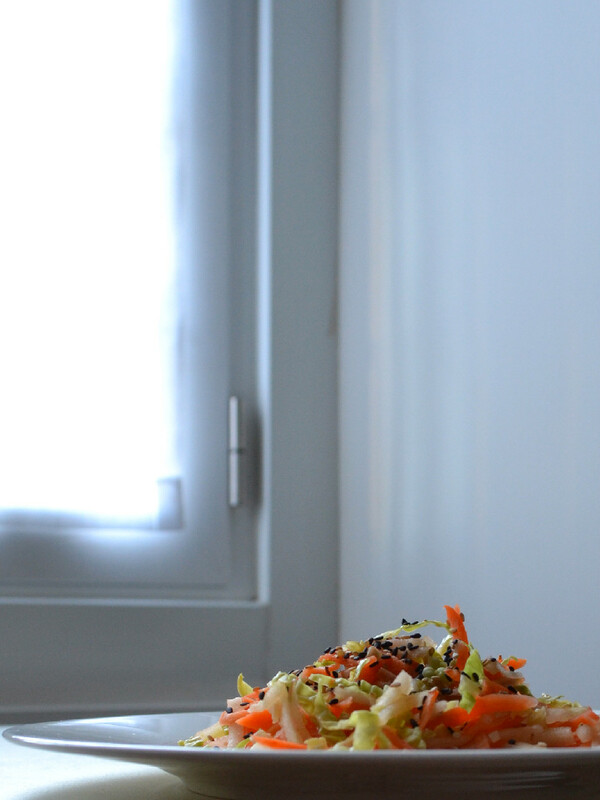 One of the first macrobiotic recipes I learned to make. Salads are a perfect starter or accompaniment to any meal. However, raw vegetables can be difficult to digest for some people, as our bodies don’t easily digest the cellulose fiber in vegetables. Of course, not all vegetables were created equal and some are certainly easier to digest than others. One way to improve the digestibility of raw vegetables is to press them, which is essentially pickling the vegetables. This process releases the water from the veggies, making them more digestible while keeping their live enzymes intact. 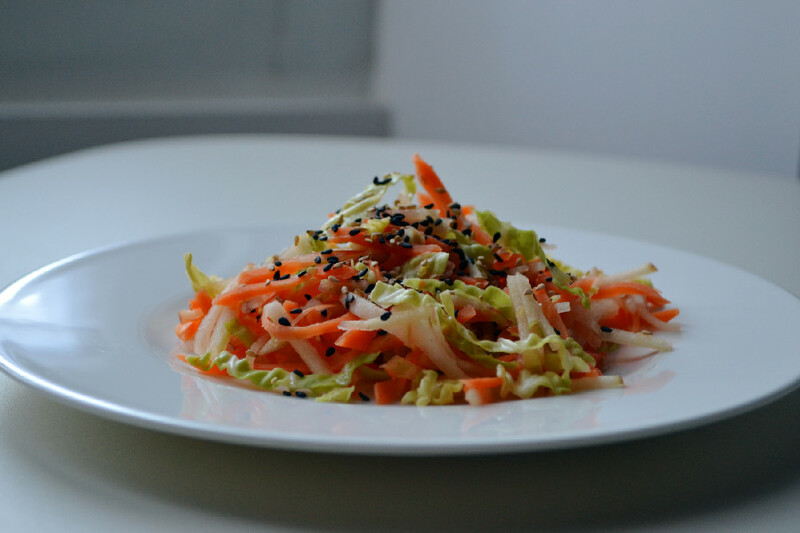 The nutritional value will vary depending on the vegetables you use, to make this salad, but the one common ingredient to all pressed salads is the umeboshi plum vinegar. Umeboshi plums are a Japanese fruit which is actually an apricot. It is fermented and used in many Japanese preparations, whole or as a paste. The brine that remains, which contains beneficial organic acids that aid in digestion and nausea, is known as Umeboshi Plum Vinegar. It’s salty, sour and fruity and just a small splash is all you need to add umami to your dish. Check out some of my other recipes that use this great condiment. Toppings: toasted black and white sesame seeds, rehydrated raisins, walnuts or other nuts/seeds of choice. Grate or slice the veggies as thinly as possible with a knife or potato mandolin. Toss them together in a bowl, add umeboshi vinegar and massage the vegetables with your hands or tongs for about a minute until they start to release some water. Place a plate or same size bowl on top of the vegetables, pressing them between the bowl and plate/bow, place a heavy weight on top like a water bottle or heavy book, and let sit for 1 to 2 hours. After the time has elapsed, drain the veggies, and squeeze out any excess liquid with your hands while transferring them to another bowl. Sprinkle with toasted sesame seeds and serve immediately or store in an airtight container for up to one week.